VFMC Jackets are made to order by our supplier. Click the links below to download the order form. Founded in 1981, the Valley Forge Mustang Club is an informal social club dedicated to enjoying and preserving the Mustang enthusiast hobby. As a regional chapter of the Mustang Club of America, we enjoy everything Mustang from classic to late model. cool things like club trips, caravans, road rallies, tours and lots of car shows. Members and their families enjoy an annual summer picnic, a Christmas party, a monthly newsletter, poker runs, drag racing, trips to the Jersey shore. etc. Weather related delays or cancellations will be posted here. Check this page for weather updates. 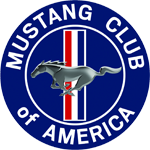 The Valley Forge Mustang Club (VFMC) is a chapter of the Mustang Club of America (MCA). Not all Mustang clubs and online communities are affiliated with the MCA. The VFMC was founded in 1981 and is going strong and attracting new members all the time.